Sacket's Harbor, Morgia's Beach and surrounding area, N.Y.
We arrived in Syracuse, NY late in the afternoon. We were here for a my wife's family reunion. I remember family reunions as a kid and this was going to be a little different. Now I am the uncle that I use to whiz by playing or talked to while waiting for dinner. Also this one will last a week. The next morning Gerry and I went to the Farmers Market in Syracuse for some items for the week. We went back to Gerry's and packed the cars for the beach cottages and our vacation / reunion at Morgia's beach just outside Sacket's Harbor near Watertown, NY. We drove for a little over an hour on the freeway, than another 15 minutes more on countries roads to the beach. The air was filled with fresh country smells, including that of steer and cow manure. It brought back many memories of my childhood. We had two cottages, which everyone referred to as camps. One was small and had two bedrooms and the other was about 100 yds. and had three bed rooms. 7 of the younger set slept there. Since we started at the smaller house, it became the hangout. The children hang out there also mostly because of the TV which became "gamized" when Andy showed up with his Sony Game Station. This was the sunset on the second night that we were there. This is the view over Lake Ontario. We had, I think, great weather. The first couple of days were very hot and than it cooled off with a rain storm. The rest of the days were a combination of cloudy, light rainy and clear. Even the days that it rained, it was warm enough that you could be out in it and have fun. Above is one of those mostly cloudy days and beautiful. The farms and fields around the beach were alive with animals, plants and farm life. 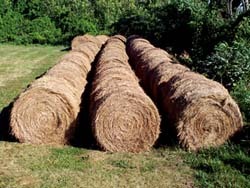 The "bale" of hay to the right is a far cry from what we called a bale of hay when I was a kid growing up on a farm. The bales of hay I remember, I could lift and throw onto the wagons. Now days, these things are almost as big as the wagon and they go on forever. Speaking of wagons, this one sitting in the middle of a field was the contract that shows the diversity of the farm land that surround the Sacket's Harbor area. 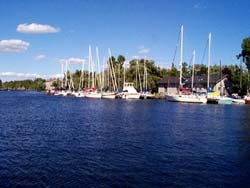 This is the harbor of Sacket's Harbor. Light sail and motor boats here these days. 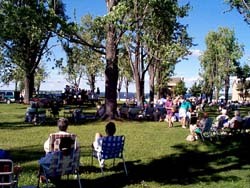 Sacket's Harbor is where the war of 1812 was fought. Each year there the tall ships come here and there is a reenactment of the foot and water battle. There are many shop and restaurants in this harbor area. Saturday evenings there are open air concerts downtown on one of the battle grounds. Towns people, neighbors and visitors to the area all gather for the festivities. This evening it was big band music. 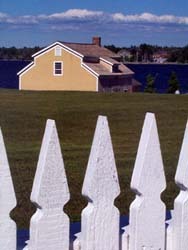 Right next to the concert area looking out toward the harbor, we see evidence of the historic district in the picket fence and the architecture of some of the buildings. Barely two minutes out side of Sacket's Harbor is Morgia's Beach. 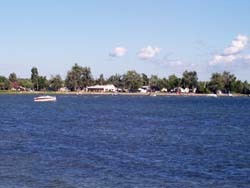 A private beach community on Lake Ontario. Here we are looking East at the cottage area. This is a closer look at the cottage area. The water is shallow till you get about 100 feet off shore. There are many sand bars as you walk out into the water. The temperature of the water was about 80 degrees F. It was hard for me to imagine that in winter, this is a very cold place with up to 3-5 feet of snow and the lake freezes. The lady that owns the cottage where we stayed said that her brother will go ice fishing sometimes and may have to bore down as much as 3 feet in the dead of winter. Back at the cottage we found this welcome visitor, a caterpillar type creature. It was the coolest creature that I have seen in a long time. It looked like it was on acid or something. It was a cool teal color with light blue and yellow spikes and what looked like horns that were also very colorful burnt orange. We watched and took pictures, than moved him/her under one of the cottages so no one would step on it. A great natural find. If you go to the top of the page and click on the link to larger photos, you can see this creature better. This is the sunset from the lookout where we walked. On Wednesday, Anatole, Mike and I (Gar) drove to the Adirondack mountains to find a place to go hiking. We had planned all week that we would go on Wednesday and on Wednesday it was raining, so we went anyway. We drove to Cranberry Lake to a State Park and found a trail, Big Bear Trail which lead to this Lookout of Cranberry Lake. It was not raining at the time of this picture, but it was still very cloudy so you can't really see the full extent of the view. I'm sure on a clear day, it would be spectacular. It did rain most of the time we hiked and we still had a great time. Tuesday night as we sat around a bonfire talking about where to go hiking the next day, Luke from the next door cottage suggested that we go to Wet Rock, a hike he had taken to a water falls. We found out later that it was actually Whetstone Gulf State Park just off Hwy. 12 and State Route 177. On Thursday it turned out to be a beautiful day, so Anatole, Aaron, Kevin (a Phish buddy of Aaron's), Andrea and I (Gar) ventured out to find this park and trail. When we arrived, we found out that it was a 4.8 mile loop ( Gorge Rim Trail) that had the water falls at it's half way point. We all decided that we could make the trek. This is the first photo opportunity that I got to see what the gorge looked like on the way to the falls on the "south loop". If you ever decide to take this hike, be sure to start on the south loop and return on the north. The south loop is a much more gentle climb than the north. Here we are at the half way point. Andrea was so glad to be here. We all expressed a couple of screams of delight. Andrea was particularly excited to have gone this far. We stopped at the falls and waded in the water. The guys explored the falls and I sat in the cool waters of the stream in some of the rapids. Just behind where the limb is sticking in the water, is one of the places where I sat as the water spilled over my shoulders. A great place to be on a hot day. We stayed and played for about 15 minutes. Looking over the falls. The strata of the rocks made for a stair stepping effect for the water to tumble over in the falls and in the rapids. A look through the tree branches to the bottom of the falls from back on the trail. This is from the north rim looking back toward the falls. From the same place as the photo above, this time looking out toward the mouth of the gorge. A little later on the trail, another view toward the mouth of the gorge. The air was so clean and fresh. The smell of the trees and water made the hike a complete joy. At one point Andrea and I were talking about hiking and about what our experience of hiking was and she ask me why I like to hike, and my best answer is that " I like to experience myself and that part of me that is nature". The last evening that we were at the beach, I went out to take some pictures and found this beautiful image of the sun's rays streaming through the clouds. A wonderful way to end this portion of our vacation.